My 1980's Bear. can You ID Him? 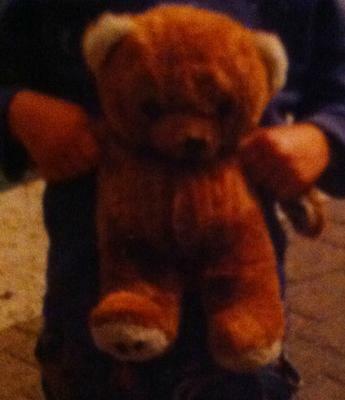 I received this bear on the day I was born (4th May 1988) as a gift from my Aunty. All I know is that she probably purchased it in April/May 1988 on the UK High Street (potentially Bristol and possibly in Mothercare or Children's World). I lost the bear about 8 years ago in Cuba and never got it back. So I am desperate to find out where he's from, so I can buy another second hand one. He has a short muzzle. A plastic nose (black) and plastic hazel/brown eyes. His stuffing was soft, like cotton-wool style? And his fur was a caramel brown colour, texturised. With lighter sections on the insides of his ears, and ends of his hands and feet. He also had stitched paws/claws, in dark brown stitching. The only other thing I remember about him is that he had a very small white tag on his back. When I was kid I remember a small logo on it, perhaps the shape of a bear's head? But as the years went on, the tag lost any text or logos. Any help would be so so so appreciated! I'm desperate to find out where he was from. Sadly bears from this era bought from chain stores can be incredibly difficult to identify. They were mass made, looked like many other bears of the time and due to their cost were often discarded and thrown away in the end. I have spent some time trying to find a similar bear but have not come up with anything. All i can recommend is that you write to mother care to see if they have a archive and can help. However even then i think it will be incredibly difficult to find the exact same one still around. Comments for My 1980's Bear. can You ID Him? Ahhh!! That's the one I had! I just lost mine Last week. I am doing a search just as you are. I got mine in 1988 as well. We just found him! Literally, as I was typing this we got word that he was found!! But I know how hard it is to lose something so special. I will contact you when I find out a place that has them. I own a bear similar to yours except it has no claws, the musle is brown and light brown velvet covered, and instead of caramel brown it's more like light taupe-brown. But all the rest is same, proportions (head as large as body, limbs, ears), brown eyes, the light beige under paws and inside ears. I got mine the day I was born too in summer 1988. The overall look struck me. I have a strong feeling that they are from the same company. I have one picture of my bear's early years when it still had a brown ribbon around its neck, one inch wide. My sister thinks it was made by Gund, but I've done some research and it came to a dead end. I am so sorry yours was lost. I feel for you because I'd be devasted to lose Leelah. I have one. But he doesn't look anything like that now! I've got one similar or at least he was, he's got a second skin now covering his original. I believe he is from mothercare. He has a Facebook because I'm crazy like that. "teddy lumps" if you search unsurprisingly he comes up straight away. He is quiet a character.